After many months of heavy anticipation, the day has FINALLY come! 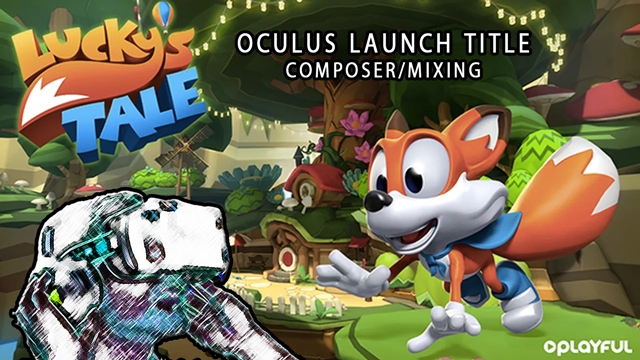 Lucky’s Tale, the whimsical 3d person platforming launch title for Oculus Rift, has launched! As the composer and mixer for Lucky’s Tale, I couldn’t be more proud of how it all turned out. Though it has only been out for a few hours, it has already been called “The Gold Standard For Third Person VR Video Games” by UploadVR and the “Super Mario Bros. of virtual reality” by Gizmag. Composing the music and mixing the sound for Lucky’s Tale was one of the highlights of my career. Not only did my music have to capture the nostalgic charm of classic third person platformers, but the projects whole audio team also had to solve many new challenges brought on with the VR revolution. Having such wonderful visuals and the immersive VR environment Playful designed is a unique experience I feel quite fortunate to be a part of! I was grateful for the support of Playful Audio Director David Chow, who composed, arranged and implemented lots of his own music, helped diversify the music and created a dynamic audio system that evolved as the environment and gameplay changed. Through the coming months I will be making a series of posts and giving talks about how I, Matt Piersall and Chris Carroll at Gl33k, and David Chow at Playful solved those VR audio challenges and crafted an immersive VR title using compelling sound! While waiting for my own Oculus order to arrive, I look forward to seeing all the videos of players mesmerized by the Lucky’s Tale experience. Luckys Tale – VR Composition Demo Reel from Aaron Brown on Vimeo.